This web page provides links to additional information related to the film Wings of Defeat (entitled Tokko in Japan). The documentary features interviews with four former kamikaze pilots and five survivors of the destroyer Drexler, which sank during the Battle of Okinawa after being struck by two kamikaze aircraft. Wings of Defeat had its US premieres in New York, San Francisco, and Washington, D.C., in March 2008, the same month the DVD was released in Japan. The US release of the DVD is planned for the last half of 2008. The DVD also contains a special feature entitled Another Journey, a documentary of the trip to Japan made by two Drexler survivors in July 2007. 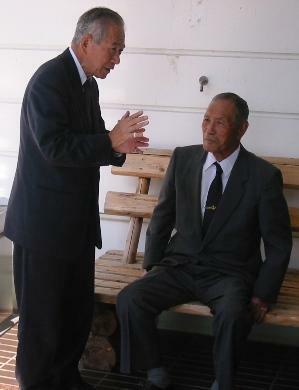 They met several former kamikaze pilots and visited two kamikaze-related museums. The web site Wings of Defeat includes photographs, background on storytellers, film synopsis, and various articles in the press. Chiran Peace Museum for Kamikaze Pilots - Air base from where kamikaze squadron led by Hajime Fujii took off toward Okinawa. Visited together by Fred Mitchell, Gene Brick, Takehiko Ena, and Shigeyoshi Hamazono in Another Journey.